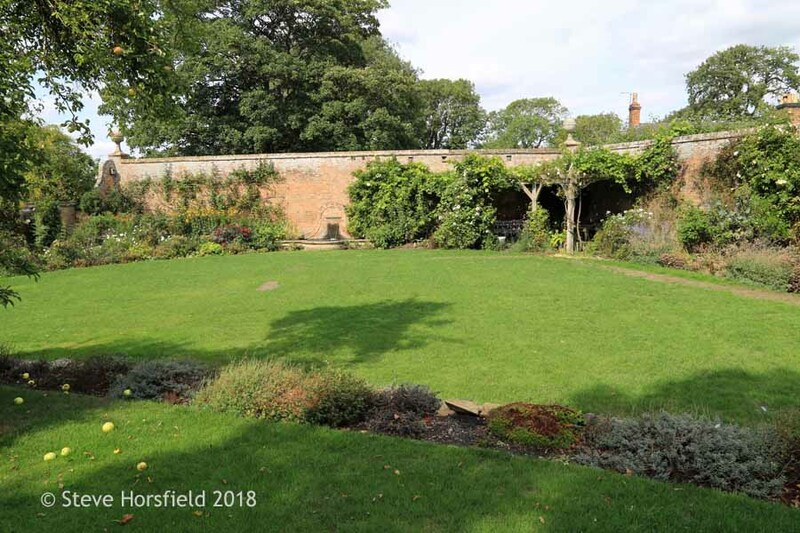 After my husband and I exited the Walled Garden and took a brief rest on a bench, enjoying the views into the open park-like landscape, we explored the part of Parham Gardens that is called the Pleasure Grounds. We only had to walk a little bit further to the left to stumble over this stunning maze. I am used to mazes designed with precisly clipped high hedges, but this was the first time that I have seen a maze layed out with brick flat onto the lawn. I liked it quite a bit. This is certainly a kind of design that would be more doable in a private garden, if you are inclined to attempt to create a maze for your own amusement. One detail about Parham that was rather striking to me were the ancient very tall specimen trees. 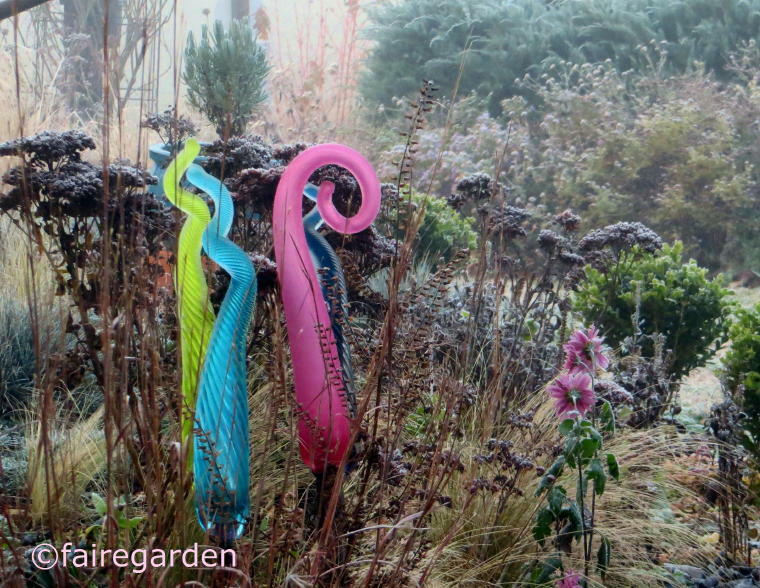 This photo illustrates very well how much charm and life they give to this garden. Imagine the maze with only lawn in the background. Wouldn't be quite the same, would it? As we strolled back to the right through the Pleasure Grounds, we came across this beautiful wisteria. Like almost everything in this part of the garden is was quite big and had a lovely urn placed to its side to keep it company. I feel that every grand estate needs a pond or lake and sure enough Parham had its own. In this case the lake was quite large and had the most vivid fish that I have ever encountered. They were jumping out of the water and sloshing it with their fins as if they had spring fever. It was quite a spectacle. To my understanding the "see-through" wall had no other purpose than being a decorative element in the garden design. Looking back to the Walled Garden you see the "see-through" wall from the other side again, flanked by two wisterias with urns on the outer sides. I always find that symmetry brings harmony and peace to a garden and has immediately a calming effect on me. Close-up of the wistera. It was quite a beautiful variety. I am not a wisteria expert, but it looked special to me. Close-up of one of the urns flanking the wisteria. What a wonderful piece! This part of the garden had such a wonderful romantic feel to it. I could have spent a whole day here just listing to the sounds of nature and enjoying the views. Tall trees were spending refreshing shade. On the way back to the walled part of the garden our path led us up these charming stairs. Re-entering the Walled Garden we had a lovely view of a long double border, again! The size of the border was just striking. .... he was in good company by another beautiful one placed close by. I absolutely would love to have something similar in our garden. On the inner side of the Walled Garden there were flower beds planted at the foot of the impressive walls. Here they grew blue iris together with a white flowering clematis. This bed is striking in its simplicity! Lovely vessels were placed into the beds. I wonder what function, other than being decorative, they once had. The contrast between the airy light yellow flower stalk and the organic form of the vessel with the dark patina is just pure pleasure for the eyes. This is the Wendy House, build in 1928, a playhouse for children build into the wall. My husband peeking out of the door gives you an idea about the size. Inside there was a fireplace and a staircase that led to a second story. Quite cute and certainly special for the children, who had an opportunity to play in it! In the next and final post about Parham I will show you more pictures from the inside of the Walled Garden and a lovely pelargonium collection displayed in an old greenhouse. 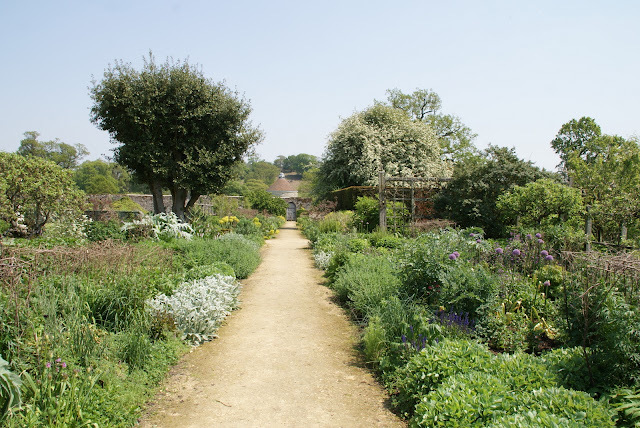 Today I will continue my series of posts about Parham House and Gardens in England, which my husband and I visited in May last year. If you would like to view my first entry about this gorgeous estate please click on the link Parham House and Gardens, England - I and it will take you there. In this post I would like to focus mainly on the plants that I saw around the area of the fruit tree meadow and another huge double border. There were many of them that looked so beautiful, lush, and healthy, I just wanted to transplant them to my own garden right away. I was completely smitten with these beautiful blue flowering plants. I assume they are the famous English bluebells that you can find blooming in masses in England in early spring. In this garden there was only a small patch of them and they were beyond their peak, but still so lovely to look at. The contrast between the white flowering shrub and the old stone wall is quite attractive, don't you think? The peonies were almost done, but there was one sumptuous red variety that still had some of its gorgeous flowers left. 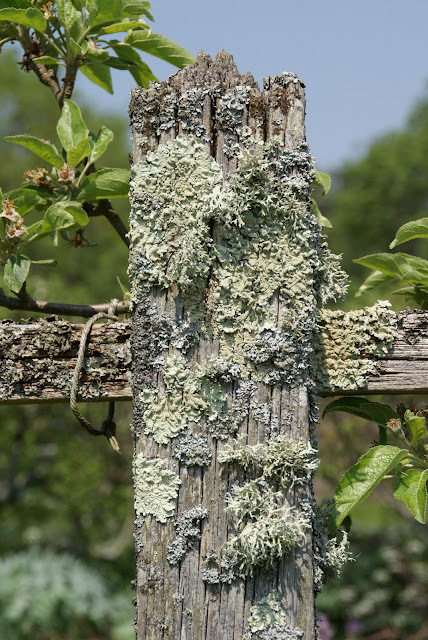 The simple beauty of the lichens on the old fence post, which was part of the fence surrounding the fruit tree area, was quite fascinating to me. 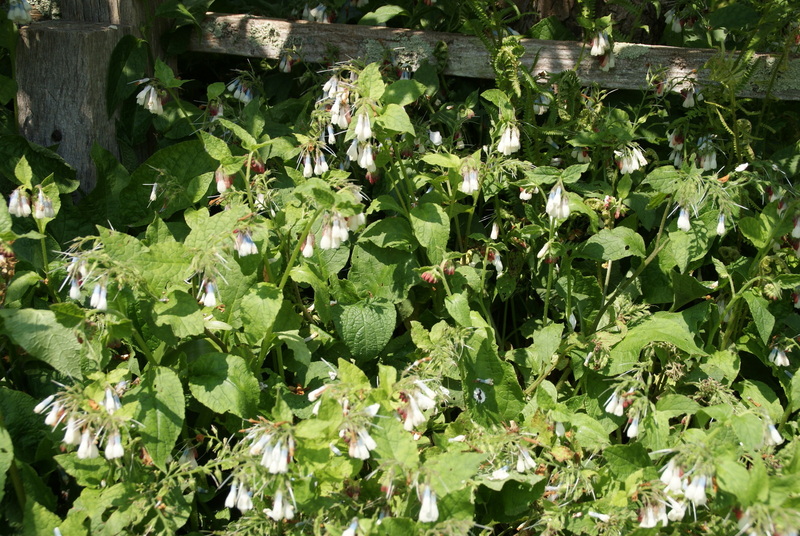 I assume, that for many of my readers aquilegias are very common plants and therefore there is nothing special about them, but they are very hard to grow here in Southern California, I guess because our climate is too hot and dry, so I can still get quite excited about them. This one has found a nice niche to live in by a wood fence post close to a fruit tree. Check out this very charming mixture of plants. 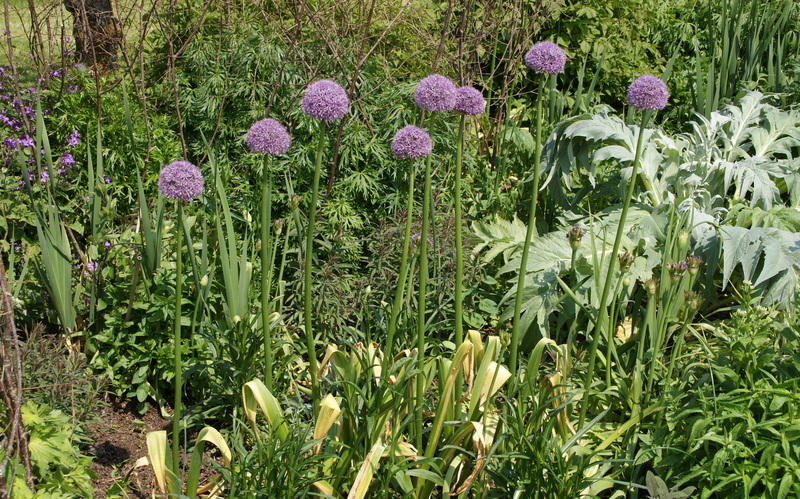 Usually I feel that lilac and clear red don't go so well together, but I think the alliums with the tulips are forming a quite interesting color contrast. A simple but very alluring plant - at least to me. And then there was this plant, which totally blew me away. I asked a gardener, who was working in a bed close by and she told me the precise name. I jotted it done on a small piece of paper and, of course, I lost it. As far as I remember it was an ornamental artichoke, but I might be wrong. If anyone recognizes this plant can you please leave a comment on my blog? The plant had a wonderful effect in the bed where it was growing, but I also can see it being an extraordinary companion plant to white roses, if you have the space for a companion plant this big, that is. 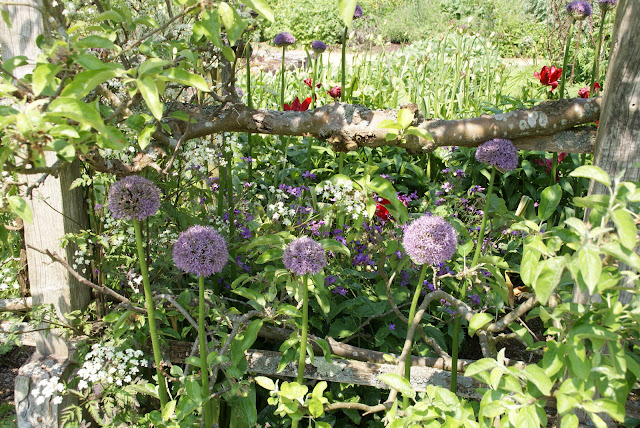 Here is a shot of a part of the second double long border that we saw. Roughly in the middle of it, on the left side, you can see the big silvery leafed plant that I showed you in the photo above. I think this photo gives you a better idea of how huge this plant really is. 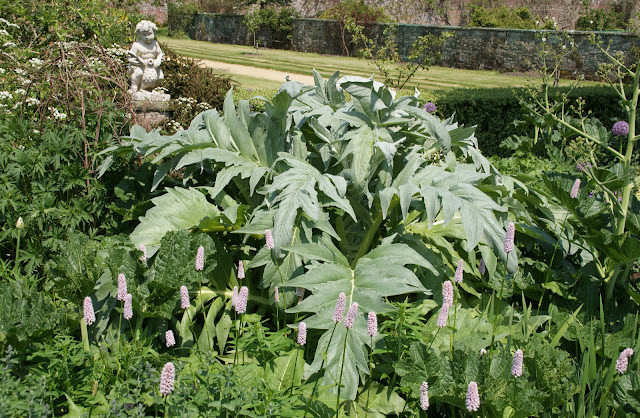 The border is equally impressive size-wise and they actually used this plant repeatedly, even though you can't see it in this image, because it shows only a limited part of the beds. I am sure, that as the season was progressing, there will be a lot more in bloom in this border. I would have loved to see what color scheme, if any, they have chosen for these humongous beds. 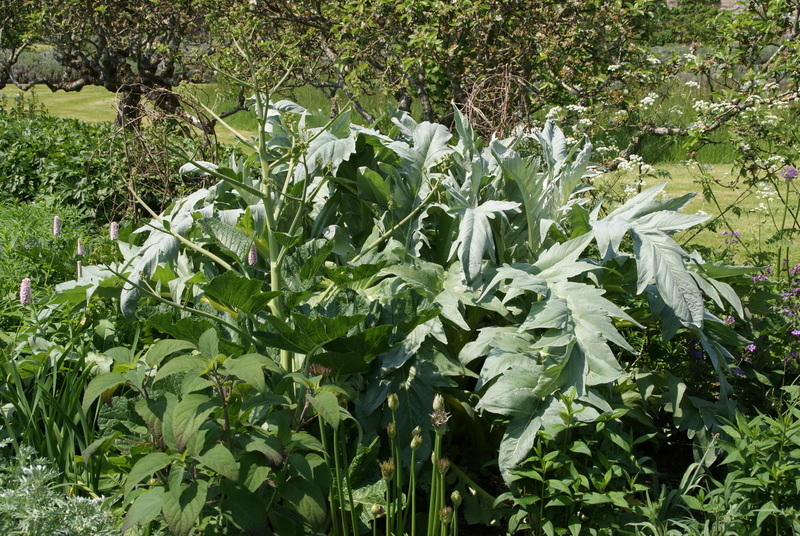 Can't help myself and have to show you one more of the silvery leafed plants. I think it is such an incredible beauty and an eye catcher as well. By the way, I love the putto in the background! This is one of the old fruit trees I believe. How artfully they have espaliered it! More lovely alliums together with my favorite silvery leafed plant. 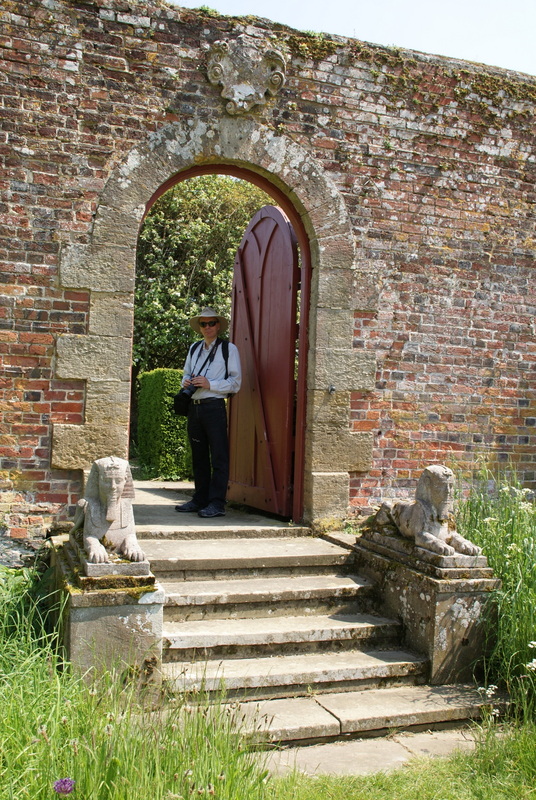 While my husband is still standing hesitantly in one of the exits of the walled garden - it was quite hot and humid that day and he was a little tired - I had already slipped past him in my ongoing excitement into another area of the gardens. Even tough I was a bit tired myself, I couldn't resist to explore the more informal park-like landscape, that was opening up in front of us. We decided to take a brief rest on this bench in front of the beautiful statue and then continued to check out the vast parts of the estate that we still hadn't seen, yet. I will post about it another time! 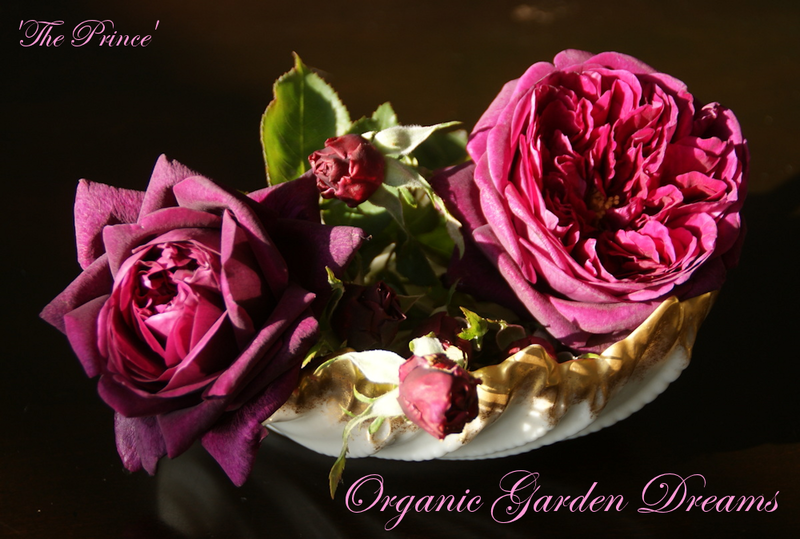 January is the month where I am mainly busy with rose pruning in the garden. Since my roses have grown significantly over the last five years and I have planted more and more of them, it has become quite a bit of a task that feels overwhelming to me at times. Therefore I intended to use the holiday week at the end of last year to get a head start, but the weather was just nasty, cold with a lot of rain, so hardly anything happened. 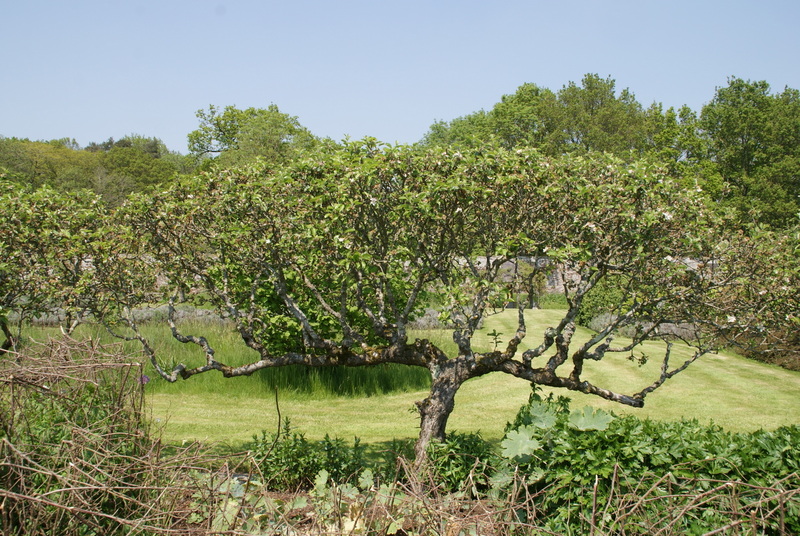 On the photo below you see the beginning of the pruning. The first rose I tackled was 'Our Lady of Guadalupe', which looked like her twin in the foreground before I pruned and deleaved it. Consequently I have to get all my rose pruning done this month as usual. I seem to be more behind than ever, but I will just focus on the rose in front of me and not think of the rest and see how far I come. It always feels so satisfying when I finished one rose and I am filled with anticipation of the new fresh spring growth and beautiful blooms to come. Besides that I am working on another garden project. My husband and I cleared the bed between the two giant Strelitzia nicolai. That was not too difficult, since most of the plants have been in containers and just had to be moved. To the very right was a hydrangea 'Endless Summer' planted into the ground, which died for some unknown reason and had to be discarded. Then the gardener installed sprinklers in that section and dug big holes for us. ...put in a repeat blooming hydrangea 'Penny Mac' in the hole to the very left to replace a Geranium maderense, that is a binial and had died as well. Not much visual change is achieved by now, but I hope when we have planted two more camellias and most likely a gardenia in the middle of the bed it will be more appealing. By the way, we are basically repeating the planting scheme that was there before. Now that we have irrigation in place I assume that the plants will grow much better and I am definitively relieved that I have to water one area less by hand. If you want to see the bed how it looked in January 2011 after we tried to do a "quick fix" until we could get to re-do it properly, please click here. Unfortunately I haven't made much progress in the White Garden Bed. But at least I found the silver gazing ball that was still hidden in a moving box. I am pleased to say that the amaryllis belladonna bulbs 'Fred Meyer Whites', common name N---- Lady's, that I planted in April 2012 have filled in nicely. Even though the lamb's ears in the foreground are not looking at their best right now, I am happy that I am finally getting the layered look that I always wanted to achieve. It is amazing to me, how clearly the gazing ball reflects large parts of the backyard. Each time when the sun hits it in the morning it lights up and is a real eye catcher. I just love it! We had unusually cold temperatures lately and I covered my Cymbidium orchids and other tender tropical plants with bed linens trying to help them survive a possible frost. The orchids and even their emerging flower stalks came through the cold spell just fine, but I got it done to break off the tips of two flower stalks when I removed the bed linens one morning. I was really mad at myself and thought the orchids would probably have done better, if I wouldn't have covered them. Oh well, at least I tried! In the bed by our front door there was a gap between the cycad and the small decorative wall, which always bugged me. So I decided that it was finally time to change that. It is a little bit of a shady place for a rose, but I decided to plant one anyway and see how it does, because I don't have too many spaces left were I can plant a rose, but many more roses in my pot ghetto. If it doesn't work I can always move it. Even though I have to admit, I hate doing that. When the gardener dug the hole, we were in for an unpleasant surprise. Plenty of pipes! Luckily he didn't cut through any of them with the spade while digging. I still decided to go ahead and follow through with my original idea to plant a rose here. I think, the roots will not be strong enough to damage the pipes and I hope they can grow around them so that the rose can root in firmly and be happy. Now what rose should I plant? My choice fell on 'White Meidland', which has been waiting to get planted in my pot ghetto for quite a while already. This rose is supposed to be somewhat shade tolerant, so I hope it will thrive in the chosen area. I think, it will look great with 'The Prince', the deep crimson colored rose to its left and the blue flowering geranium 'Rozanne' in the foreground. 'White Meidiland' doesn't impress right now, but I think it could be a winner. After I deleaved it, it looks even more puny, but I think it will take off once it is in the ground. Again, not much visual change right now after the rose is planted, you almost have to get a magnifying glass to find it, but at least the hole is filled. I hope in a few months this part of the bed will look much nicer. That summed up the garden activities that have taken place here lately. It is not too much, I know, but I am happy about every step that I am able to make to maintain and develop our little green paradise even further. Usually this blog is all about gardens, plants and especially roses. But since it was celebrating its second anniversary on January 1st, 2013 I thought, it might be interesting to have a look at the blog statistics due to the occasion. Normally I am not a big fan of math but I have to say that I find blog statistics quite fascinating. Hope you enjoy to have a look "behind the scenes" of my blog as well. And just to make sure that the statics are not getting to dry I have scattered some juicy photos of my spring garden from April 2012 throughout the text. Lets start with the most "in your face" number, the all time pageviews. As I am writing this the automatic count tells me that I have 52.523 pageviews. This comes as a big surprise to me and I am really pleased that so many people have taken a look at my blog. I haven't thought even in my wildest dreams that I would get that many pageviews within only two years, since I am not blogging that often and mainly just have a small suburban California garden to write about. Even more astonishing to me is the number of people, who are following my blog. By now 167 followers have signed up. Last year I only had the possibility to blog 23 times in comparison to 58 posts in 2011. I sure hope that I will be able to blog more this year, since I am still enjoying it tremendously. It is simply a matter of finding the time. These are the obvious numbers that you all can see on my blog on the right side bar. But now I would like to share with you some hidden statistics, that normally you don't have access to. The highest pageview count per month was reached in April 2012 when it hit 3.519 pageviews. The best pageview result per day occured just recently, when the counter jumped over the 200 pageviews/day barrier for the very first time and closed with 266 clicks on 01/04/2013. My most popular posts were Rose of the Month: 'Iceberg' with 1701 pageviews, closely followed by Rose of the Month: 'Our Lady of Guadalupe' with 1673 pageviews. The third place was taken by my very first post Humble Beginnings with 1645 pageviews. Fourth and fifth place were going again to two posts about a specific rose variety Rose of the Month: 'Sweetness' and Rose of the Month: 'Zephirine Drouhin'. People also seem to like when I post about my most beautiful roses that have flowered in my garden each month: Sixth place went to September Roses (2012), eighth to March Roses (2012) and ninth to July Roses (2011). Why these posts were preferred over all the other monthly rose flower posts I have no idea. Also I can't think of what the explanation might be why the post about Amaryllis landed on place seven and even more obscure why Arundel Castle, England, Part IV ended up being on place ten, especially because this is a series of four posts about the Arundel Castle and Gardens. Go figure! If you like to see one or more of the ten most popular posts on my blog you can just click on the titles and the links will take you there! One of the most interesting question to me is who is actually reading my blog? My audience is predominately American with 25.996 pageviews coming in from the USA. That is wonderful but not surprising, since I am gardening in California and write my blog in English. Second place goes to the United Kingdom with 2325 clicks. The reason that the United Kingdom is the runner-up could be connected to the fact that I sometimes write about my garden travels to England, which might be particularly interesting to my British readers. On the third place we find the Ukraine with 1879 clicks. Fourth place goes to Germany with 1515 pageviews and fifth to Australia (1182 pageviews). Place six is taken by Canada (1164 pageviews) and seven by Russia (1073 pageviews). On place eight we find India (933 pageviews) and China (892 pageviews) on place nine. France is on the tenth place with 640 pageviews. There are pageviews from many more countries and altogether it turns out that my readership is quite diverse. I am very happy and fascinated that literally I am getting readers from all over the world! That was my little peak into the statistics of my blog. It might be interesting to compare them with what is going on at the same time next year and see if there are any significant changes. I am curious, so I would like to ask my fellow blog writers, are you looking at your blog statistics from time to time, too? And if so, what are the most exciting facts and information for you? Lastly I would like to take the opportunity to thank everyone for coming here and read my blog, signing up as a follower, leaving comments, asking questions, identifying plants, giving advise, and building internet friendships. What would my blog be without you, my dear readers?